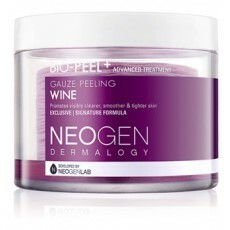 If you are looking for a peel or an exfoliator that manually and chemically peels off dead skin cells the easiest way, then Neogen's new innovation in peeling is your best choice! This is a woman's lazy way of exfoliating these days! This huge tub contains 30 pcs. of single pads infused in a wine ferment called Resveratrol. Through this powerful AHA that penetrates deep into your pores, AND the Triple Layer Pad Technology of Neogen that scapes off oil, dirt and dead skin cells, your pores are uncloged and your complexion clearer and smoother! Gentle to skin which can be used twice a week or daily or according to your skin needs. After cleansing face, fish one pad and insert your finger in the slit provided. Using the rough side of the pad, massage face using a circular motion against the grains of your skin (from outside to inside or from bottom to top of face/neck). Once done, flip the pad and use the smoother side to finally swipe away remaining dirt or unwanted debris and oils. Rinse face with water. Follow with your toner, essence, serum, and moisturizer. Use twice or as often as your skin needs it.